Arthur - I’m Dr Arthur Smith. I’m Deputy Head of Scholarly Communication at the University of Cambridge and this is Professor Hawking’s PhD thesis - Properties of Expanding Universes. I think it’s actually his copy of his thesis as well. Georgia - Introduction: The idea that the Universe is expanding is of recent origin. We could just sit there and read his PhD if we wanted? Arthur - Yeah. I think you could probably get through the introduction but then, by the time you get to a couple of the other chapters, you might struggle a bit. Georgia - Here’s some handwritten equations that I couldn’t begin to comprehend. Arthur - No. This thesis, obviously, predates a lot of computers so it’s all typed by typewriter. Then a lot of the equations and then a lot of the symbols and notations are all done in his own hand. Georgia - Have you ever read it? Arthur - I have skimmed it. Georgia - Is it possible to skim? Arthur - Well, maybe not. I think there is certainly a lot of knowledge contained in this thesis and to get a full appreciation for it is probably going to take some people probably a lifetime. Georgia - And for others, including myself, that’s probably not long enough. Why do we have a copy of the thesis here? Arthur - As part of all PhD theses, all students are asked to submit a copy of their thesis. The University Library has a copy of his thesis and we’ve held that copy since he submitted it in 1966. It wasn’t until recently though that they were digitised. At the time, what people could do is you could ask the library for a copy of the thesis if you wanted it and the library would digitise the thesis and charge you for that privilege. His thesis was first digitised by request in about 2013. In about 2015, when the Office of Scholarly Communication got started up, we did a big push to make a lot of the old PHD theses from the University available online, so that happened in 2015. Georgia - Right. Then when did it become publicly available? Arthur - We did a lot of work last year - 2017 - working with Professor Hawking and his team to get permission to do this. We made it available in Open Access Week, which happens every year which celebrates open access to research publications, so that happened in late October, 2017. Georgia - So then the floodgates opened I suppose? Arthur - Yes. The floodgates or the dam burst is, I think, the better expression. When we released his thesis we got a huge amount of interest. Within a couple of minutes we’d had thousands of downloads; people are hugely interested in his work. Georgia - How many do we know in total who have read this? Arthur - I don’t know how many people have read it - that’s a more difficult question, but we think about 1 to 2 million people have downloaded the thesis. Georgia - That’s incredible. And that’s more than any other thesis? Arthur - Oh absolutely. It’s almost more than all the rest of the items that we have in our open access repository combined. Georgia - Do you know if this is all physics students from around the world or is it more just the general population? Arthur - No. I think this covers everybody. We’ve seen downloads from, I think, every country on Earth covering all spectrums. I think the interest in this thesis goes beyond just the physics community; it spans all sorts of people in the world. Georgia - I do feel quite privileged to be looking at it in this form with all these handwritten equations and full of cosmological solutions. I suppose that’s why people want to read it, it sort of promises a glimpse into how the universe works? Arthur - Yeah. I think everyone is interested in where we’ve come from and where we’re going in some sense. 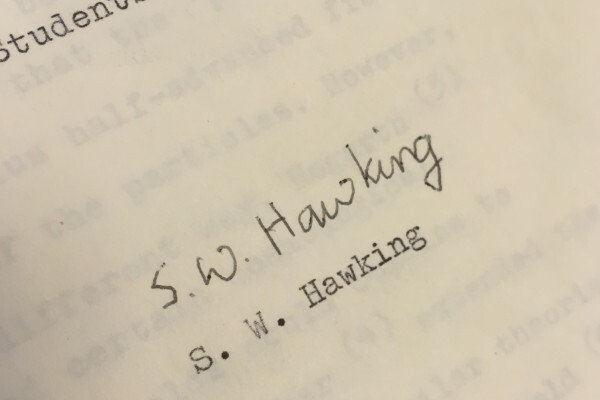 And some of those answers, or attempts at answers at least, are in this thesis and really sets the groundwork for what Professor Hawking’s work was going to be for the rest of his life. Georgia - Are there any photos in it? Arthur - I don’t think there are any photos. Georgia - It’s not a picture book.